Unlike the “politically correct,” evolution-influenced history curricula used in America’s public schools, and even in many Christian schools, this biblically based curriculum shows students the real history of the world! This teacher guide supplies a structure that can be easily modified for the particular needs of your students. 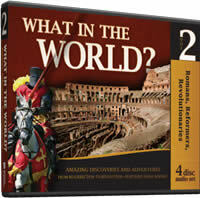 It provides multifaceted creative ideas, teacher tips, and spiritual application to spark your students’ discovery and exploration of the amazing events of ancient times. 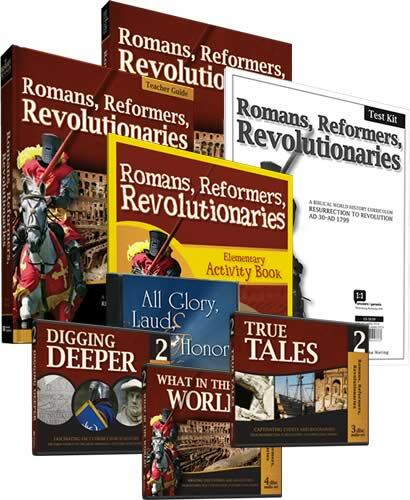 View the whole Romans, Reformers, Revolutionaries collection. During this tumultuous time of history, the Church explodes throughout the world, uncharted regions are explored, distant cultures are united, and religious wars burst into flame. Technology, medicine, philosophy, and art sweep nations into bitter turmoil and proud independence. Through it all, you will see God moving behind the scenes to accomplish His purposes, inviting kings and peasants alike into His kingdom. This curriculum meets the varied learning styles and perceptual modes of today’s students (visual, auditory, and kinesthetic). Young people explore history through fun and exciting exercises, plus activities that allow them to interact with and learn the material. 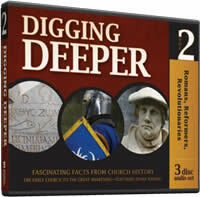 Far from just memorizing names and dates (the standard procedure in most history classes), this fascinating curriculum by Diana Waring—one of today’s most-loved historians—captures students’ attention and results in life-long learning.